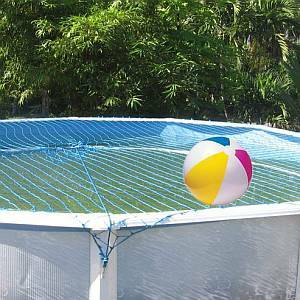 This extra strong UV stabilized Safety Net is designed to protect your pool from unwanted visitors and helps to keep your children and pets safe. It installs quickly and is lightweight for easy removal. The largest opening in the net is 3.5 inches, the openings are smaller near the center of the net .The netting is stretched over your above ground pool, and attaches to pool using a bracket system. The only tool needed for installation is a Drill with a 9/64ths drill bit. PLEASE NOTE THAT THESE NETS ARE DESIGNED FOR SPECIFIC POOL SIZES BASED ON THE NUMBER OF UPRIGHTS. PLEASE VERIFY THAT THE NUMBER OF UPRIGHTS MATCHES YOUR POOL BEFORE ORDERING THE NET. IF YOU DO NOT HAVE THE SAME AMOUNT OF UPRIGHTS THAT ARE REQUIRED THE SAFETY NET WILL NOT WORK FOR YOU. Click here for an Installation Manual. Extra strong, UV stabilized netting that protects your pool from unwanted intrusion. A unique installation system that children are unable to remove. Pre-finished net system that install on your pool in 3 minutes or less. Lightweight & easy to remove. Initial installation manual & template to make retrofitting your pool quick and easy. Largest opening in net is 3.5", openings are smaller near middle. AG Safety Net can hold up to 485 lbs.